Baduel S, Rogé B. Évaluation d’un programme de dépistage de l’autisme et impact sur l’accompagnement précoce. ANAE 2011;115:447-51. Baduel S, Guillon Q, Afzali MH, et al. 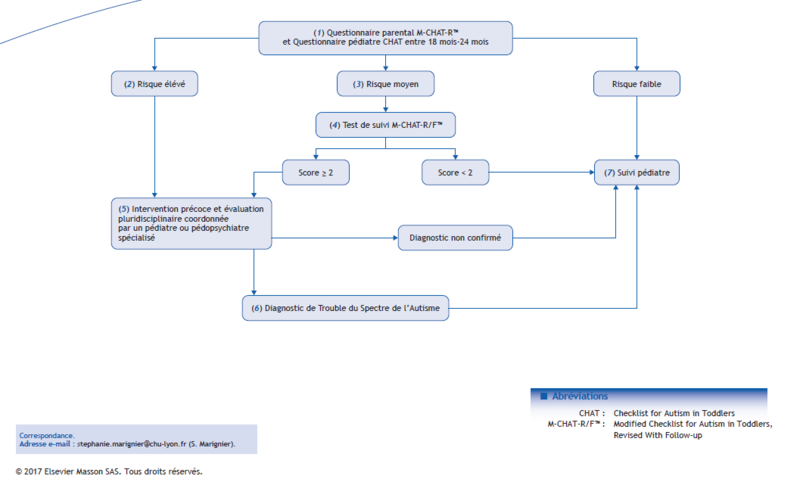 The French Version of the Modified-Checklist for Autism in Toddlers (M-CHAT): A Validation Study on a French Sample of 24 Month-Old Children. J Autism Dev Disord 2017;47:297-304. Robins DL, Casagrande K, Barton M, et al. Validation of the modified checklist for Autism in toddlers, revised with follow-up (M-CHAT-R/F). Pediatrics 2014;133:37-45.